I'm on a roll with the pastel outfit posts so I thought I would treat you guys to another today. Again, this post is very Primark-heavy, which is always a plus in my eyes. It also features the most beautiful top from River Island that I have been so excited to wear ever since I first laid eyes on it. I plan on wearing this on nights out and meals aplenty over the next few months, so fingers crossed it'll feature in a fair few outfit posts! I paired the top with the infamous turquois/minty skirt from Primark that you obviously need in your life. I am praying they release a pink version too, as it's too pretty not to be made in a rainbow of pastel hues. I'm wearing the same bag as yesterday, also from Primark (I can see this becoming a spring staple for me) and some cute little heels (with frilly socks, of course) from Primark. I love this outfit and I have a wishlist as long as my arm with even more pastel goodies I want to buy. 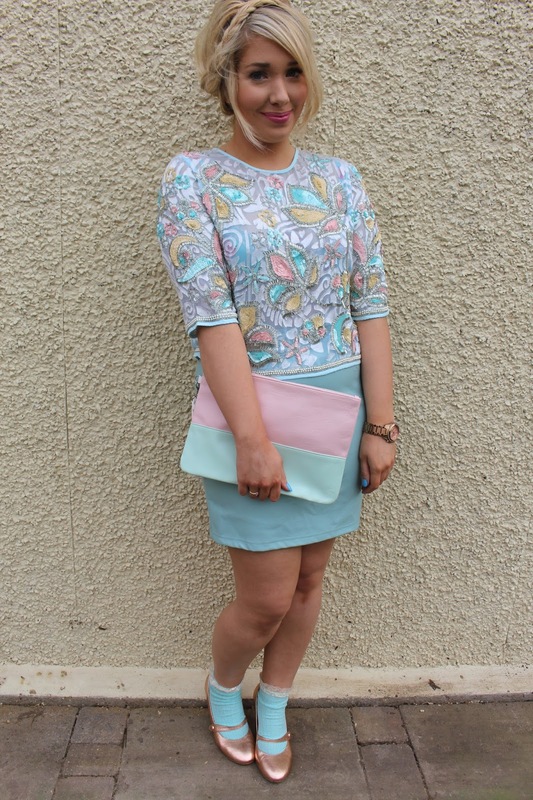 Speaking of pastels, this outfit is actually also serving as my entry into Stylefruits 'Pastel Me Pretty' competition. Seeing as I am a bit obsessed with pastels, I felt it only right to enter the competition to be in with a chance of winning a b-e-a-utiful pastel blue Michael Kors handbag. Go vote for me here - it means such a lot! Do you have any pastels on your wishlist?